An upgrade to the Novus unit, the top/rear direct vent Caliber family offers a 23" deep box in a 42" glass width size. 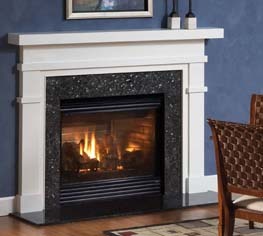 In addition to the large firebox, the Caliber offers a standard steel refractory interior lining, high Btu heat output, Quick-Access glass, removable valve assembly, heater listed, high efficiency, great looking burn and realistic looking log set. Ceramic fiber refractory and six decorative fronts available as options to create your own unique look.